As the dust settles on one of the biggest hospitality shows of the year, we take this opportunity to look back at our experience at the Independent Hotel Show 2018. We were delighted to touch down at London Heathrow on Monday evening after thick fog nearly resulted in a cancelled flight. We took comfort knowing that as a huge show with companies coming from all corners of Europe, we would not be the only exhibitors facing this issue! 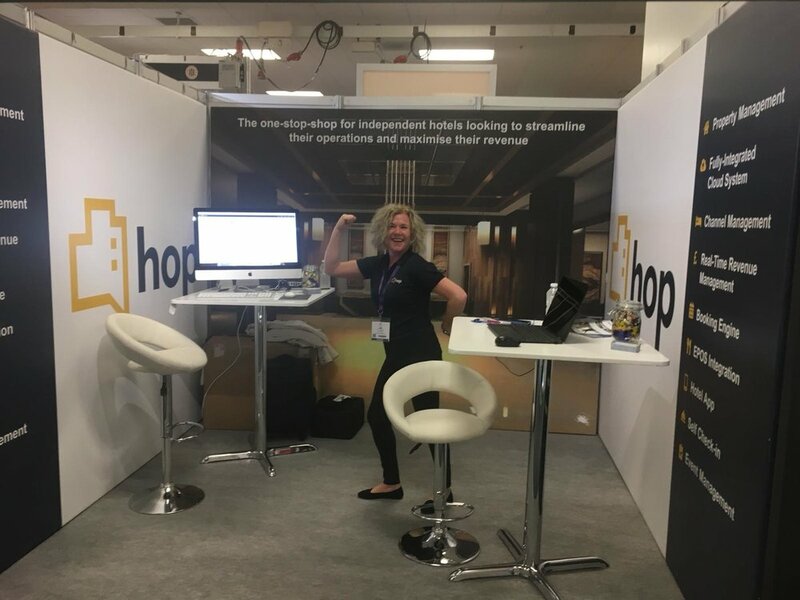 This was HOP’s first Independent Hotel Show and we were excited to see the Olympia and setup the stand. Staying just round the corner from the venue, at the fantastic W14 Hotel, we were able to get to the show early the following morning to set up the signage, which was designed and created by Big Flavour and Perton Signs. Despite a slow start to the morning, the show gave us a fantastic platform to showcase HOP to the 6,546 attendees and we were able to network with other like-minded exhibitors. Around one-third of these attendees were at the show to source alternative technology solutions, making this the ideal opportunity for us to highlight how HOP can save hoteliers time and money. Ronald, HOP’s CTO, and Richard, HOP’s COO, joined the team mid-afternoon and we welcomed a number of existing customers onto the stand for a chat. It was a great first day and this was topped off by a brilliant meal at Locanda Ottomezzo on Thackeray Street. We were back to the show on Wednesday morning and by 11am, things had picked up again. We spoke with dozens of people who were keen to learn how to streamline their operational time and cost for their hotel. We look forward to attending next year’s show. If we met you at the show, we would love to hear from you and let us know your thoughts on the show. For any other SaaS companies looking to exhibit at next year’s show, we would recommend taking a larger, corner stand next to the other technology companies.